Outside: I know your birthday is around this time but I'm not sure of the exact day. 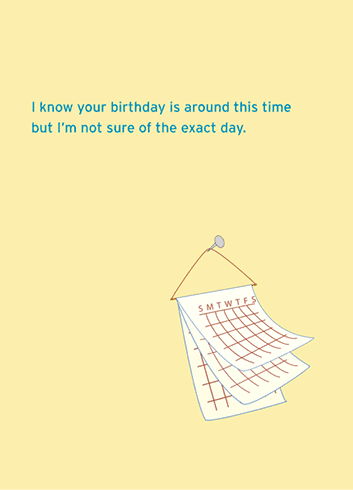 Inside: Could you do me a favor, and when it's your birthday, could you turn this card upside down and read the other side? - - -> Happy Birthday, I sincerely mean that. You are a truely special person who is wonderful in every way. Few people possess your creativity tempered with your wisdom. You are like a bunch of flowers, a rainbow, etc.